This, formerly San Gerolamo dei Gesuati, was the ‘original’ church of the Jesuates or Gesuati, a little known order. Officially, the Clerici apostolici Sancti Hieronymi, they were founded in Siena in the 14th century and became familiarly known as 'poor Jesuates' because of their constant calling upon the name of Jesus and their poverty. 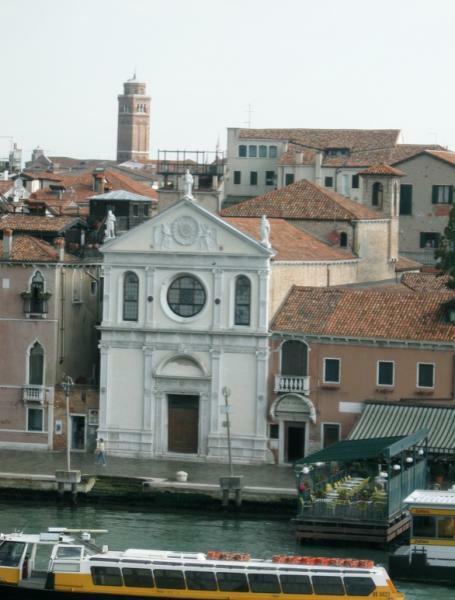 The Venetian government gave them a monopoly on distilling wine, enabling them to raise enough many to build this church and monastery, initially called San Gerolamo dei Gesuati, in 1524. After reforms of the Council of Trent, the order declined. When it was suppressed in 1668, the Dominicans snatched up the property, and the church took on its current dedication to Santa Maria della Visitazione which is also the real name as La Pietà on the Riva degli Schiavoni. The little church they left behind, Santa Maria delle Visitazione, is a plain but distinguished Renaissance construction, with a façade generally attributed to Mauro Codussi or Tullio Lombardo; note the 15th-century Bocca del Leone on the right of the façade, one specially designated to receive gripes about hygiene (fears of a recurrence of the plague were well founded back then) and to tell tales on people tossing rubbish in the canals. Inside is a genuine surprise, a wooden coffered ceiling painted by Umbrian artists of the 1500s. The central medallion, a Visitation, shows the gentle colours of Umbrian cinquecento art; surrounding it are panels with excellent portraits of prophets and saints. These works are almost unique in Venice; the only other central Italian art in the city is in the Palazzo Cini. The church was suppressed under the French, then reopened and reclosed; today it serves as the oratory for the Istituto Don Orione, dedicated to helping orphans and poor families, while the former monastery is now an up-to-date Religious House of Hospitality and Conference Centre, offering simple, affordable accommodation... compete with Wifi!